The Boston Bruin’s decision to fire Claude Julien earlier this month was met with mixed reactions by Bruins fans and media alike. Some praised management for taking action, believing that Julien, while being a good coach, had just become stale in the Bruins locker room. Others, including myself, disagreed with the decision. Upon firing Julien, I expected to see a difficult transition period in which an incomplete roster took a hard hit after losing their head coach. So far, Bruce Cassidy has proven me wrong. The Bruins have jumped out to a 6-1 start since Cassidy took over, their 5-3 loss at Anaheim being the only game they’ve dropped so far. Over that span, the B’s have outscored opponents 29-16, including their four-game Western Conference road trip, during which they outscored opponents 15-10. So what has changed under Cassidy? For starters, Cassidy has opened up the offensive zone. 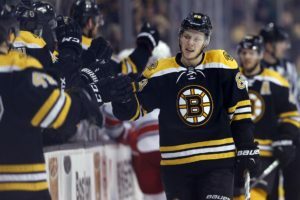 Under his leadership, the Bruins have loosened up on their structure offensively, allowing their forwards to play more freely up front. As a result, Boston’s offense has looked a bit more creative, and so far, it has worked. Boston has connected for some good-looking goals that clearly weren’t the result of a set play, such as the opening goal of Sunday’s game against Dallas. On top of that, the Bruins have played with more energy. While it’s true that the coaching change itself probably provided a spark for the team, it also is something that Cassidy has begun drilling into the minds of his players. This energy has resulted in a much more aggressive Bruins offense. The B’s have attacked opposing teams hard in their own end under Cassidy, at times overwhelming the opposition with a storm of shots. We saw a perfect example of this with Ryan Spooner’s goal late in Sunday’s game, which was the result of a firestorm of shots directed at the Dallas net. Yet, while injecting life into the Bruins roster, Cassidy hasn’t made any dramatic systematic changes. The groundwork, he believes, was all set by Julien. All Boston needed was a slightly different approach. So far, things have gone very well for Cassidy’s Bruins. The black and gold have fought their way back into the thick of the playoff race. Sunday’s win at Dallas to finish their road trip propelled the Bruins into the third spot of the Atlantic Division, a point ahead of the Maple Leafs, and just four points behind the first-place Canadiens. Having finished their Western Conference road trip, the B’s are headed home to Boston, where they’ll play five of their next six games before heading west once again for another Pacific Division roadie. The Atlantic Division is still very much up for grabs, and the Boston would like to bring this streak of winning hockey back home. The Bruins still have eight more games against divisional opponents, including three games against the Ottawa Senators, who currently sit one spot ahead of the B’s. So far, Cassidy’s presence behind the bench has brightened Boston’s playoff outlook considerably. Over the next month and a half, we’ll see whether or not he can save the season, and lead the Bruins back into the playoffs once again.